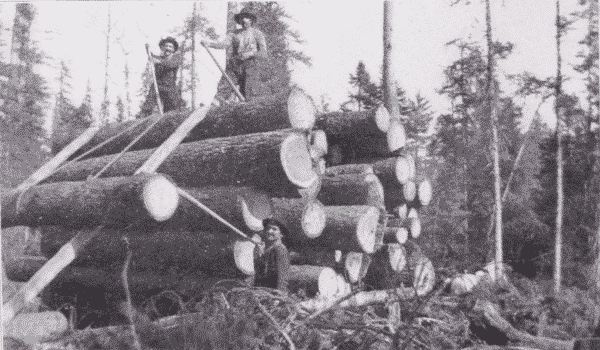 The rough and ready methods common in American logging operations are the result partly of a tradition of inexhaustible supply, partly of the fear of fire and the avoidance of taxes, partly of an eagerness to get rich quick. 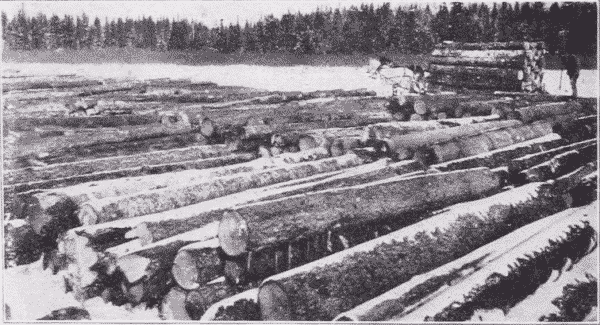 Most of the logging has been done on privately owned land or on shamelessly stolen public land, and the lumberman had no further interest in the forest than to lumber it expeditiously. Fig. 1. Making a Valuation Survey. Fig. 2. “Blazes” on Trees. Preliminary to the actual logging are certain necessary steps. First of all is landlooking. 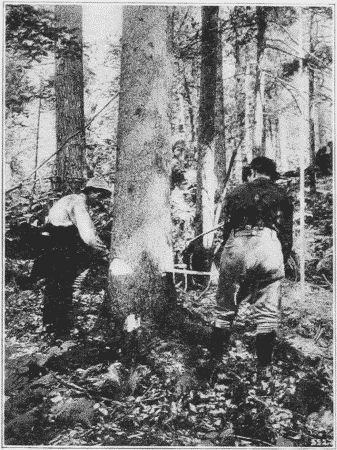 This includes the survey of the forest land for the purpose of locating good timber. Fig. 1. Most of the woodland has previously been roughly surveyed by the government and maps made indicating which parts are private land and which are still held by the government. The boundaries of townships, sections, quarter sections, eighties, forties, etc., are indicated by “blazes” on trees, Fig. 2, so that the “cruiser” or “looker” as he goes thru the woods can identify them with those on his oil paper map. The cruiser also studies the kinds and character of the trees, the contour of the ground, the proximity to streams,—all with the view to marketing the product. Acting on the information thus gained by the cruiser, the lumberman purchases his sections at the proper land office, or if he is less scrupulous, buys only enough to serve as a basis for operations. Enormous fortunes have been made by timber thieves, now respectable members of the community. As a further preliminary step to lumbering itself, the tote road and camp are built. The tote road is a rough road on which supplies for crew and cattle can be taken to camp from civilization. Footnote 1: Hulbert: The Lumber Jack; Outlook, 76: 801, April 2, ’04. The camp itself, Fig. 3, is built of logs, roofed with plank, covered with heavy tar paper, and dimly lighted. There are usually five buildings,—the men’s camp, the cook camp, the office, the barn, and the blacksmith’s shop. Many camps accommodate from eighty to one hundred men. The men’s camp is filled with bunks and is heated by a stove and in general roughly furnished. Cooking and eating are done in the cook camp, where the cook and his assistant, the “cookee,” sleep. The office is occupied by the foreman, log-sealers and clerks. Here the books and accounts are kept, and here is the “van,” stocked with such goods as will supply the immediate needs of the lumber jacks. Fig. 3. 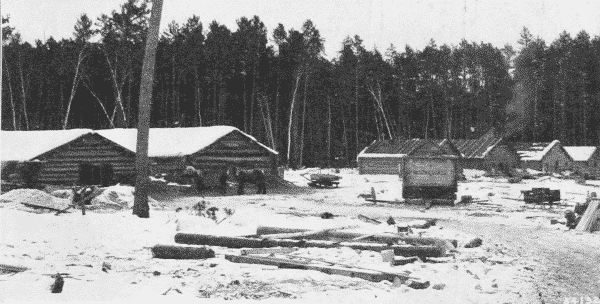 Winter Logging Camp. Itasco County, Minnesota. Before winter sets in the main road is built, Fig. 15, very carefully graded from the camp down to the nearest mill or railway siding, or oftener to the stream down which the logs are to be floated. This road has to be as wide as a city street, 25 feet. The route is carefully chosen, and the grade is made as easy as possible. Much labor is spent upon it, clearing away stumps and rocks, leveling up with corduroy, building bridges strong enough to carry enormous loads, and otherwise making it as passable as can be; for when needed later, its good condition is of first importance. This main road is quite distinct from and much superior to the tote road. At intervals alongside the main road, small squares called skidways are cleared of brush and in each of them two tree trunks, “skids,” are laid at right angles to the road. On these the logs, when cut later, are to be piled. Back from the skidways, into the woods the swampers cut rough, narrow roads called dray roads or travoy roads,—mere trails sufficiently cleared of brush to allow a team of horses to pull a log thru. Fig. 4. 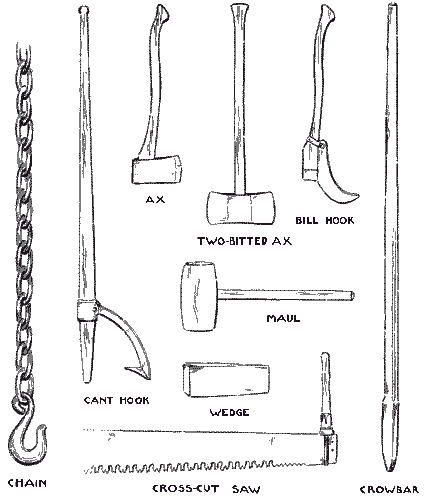 Tools used in Logging. All these are operations preliminary to the felling of trees. The tools commonly used in logging are shown in Fig. 4. When everything is ready for felling, the “fitter” goes ahead marking each tree to be felled and the direction in which it is to fall by cutting a notch on that side. Then come the sawyers in pairs, Fig. 5. First they chop a deep gash on the side of the tree toward which it is to fall, and then from the opposite side begin cutting with a long, Tuttle-tooth, crosscut-saw. The saw is a long, flexible ribbon of steel, with handles so affixed to each end that they can be removed easily. The cut is made on the pulling stroke, and hence the kerf can be very narrow. As soon as the saw is well within the trunk, the sawyers drive iron wedges into the kerf behind it, partly to keep the weight of the trunk from binding the saw, and partly to direct its fall. Then the saw is pulled back and forth, and the wedges driven in farther and farther, until every stroke of the maul that drives them sends a shiver thru the whole tree. Just as the tree is ready to go over, the saw handle at one end is unhooked and the saw pulled out at the other side. “Timber!,” the men cry out as a warning to any working near by, for the tree has begun to lean slightly. Then with a hastening rush the top whistles thru the air, and tears thru the branches of other trees, and the trunk with a tremendous crash strikes the ground. Even hardened loggers can hardly keep from shouting, so impressive is the sight of a falling giant tree. Fig. 5. Felling Red Spruce with a Saw. Fig. 6. Sawing Logs into Lengths. All this seems simple enough in outline, but the actual execution requires considerable skill. Trees seldom stand quite vertical, there is danger of lodging in some other tree in thick woods, and it is therefore necessary to throw trees quite exactly. Some men become so expert at this that they can plant a stake and drive it into the ground by the falling trunk as truly as if they hit it with a maul. On the other hand, serious accidents often happen in falling trees. Most of them come from “side winders,” i. e., the falling of smaller trees struck by the felled trees. 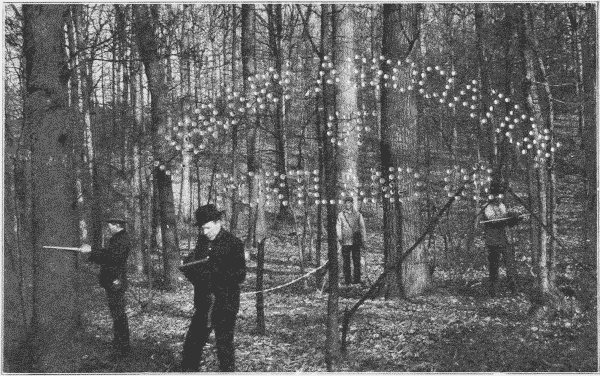 After “falling” a tree, the sawyers mark off and saw the trunk into log lengths, Fig. 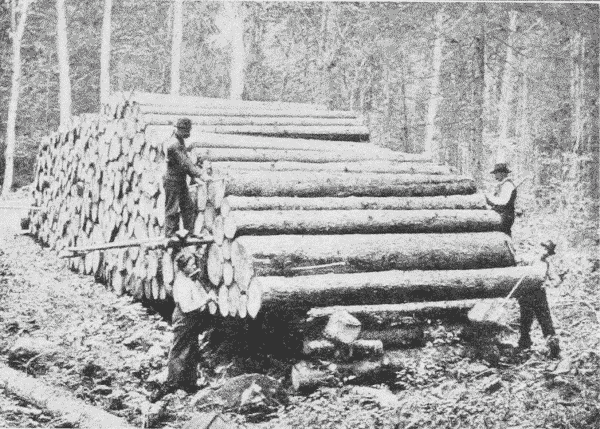 6, paying due attention to the necessity of avoiding knots, forks, and rotten places, so that some of the logs are eighteen feet, some sixteen feet, some fourteen feet, and some only twelve feet in length. Meanwhile the swampers trim off the branches, Fig. 7, a job requiring no little skill, in order that the trunk may be shaved close but not gashed. Fig. 7. 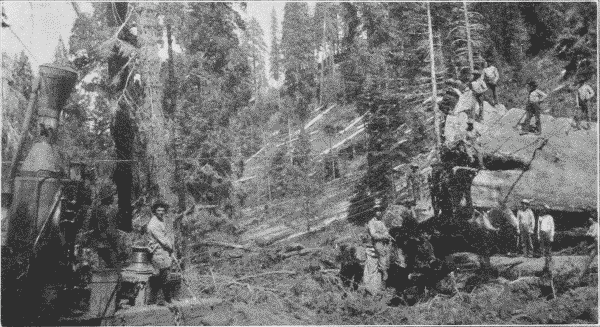 Trimming off Branches of Spruce. Fig. 8. Hauling Spruce Logs to the Skidway. This finishes the second group of operations, the felling. Next the logs are dragged out to the dray roads, Fig. 8. A heavy pair of tongs, like ice-tongs, is attached to one end, and the log is snaked out by horses to the skidway. If the log is very heavy, one end is put on a dray. By one way or another the log is dragged out and across the two parallel skids, on which it is rolled by cant-hooks to the end of skids toward the road way. If other logs already occupy the skids, each new log as it arrives is piled on the first tier. As the pile grows higher, each log is “decked,” that is, rolled up parallel poles laid slanting up the face of the pile, by means of a chain passed under and over the log and back over the pile, Fig. 11. 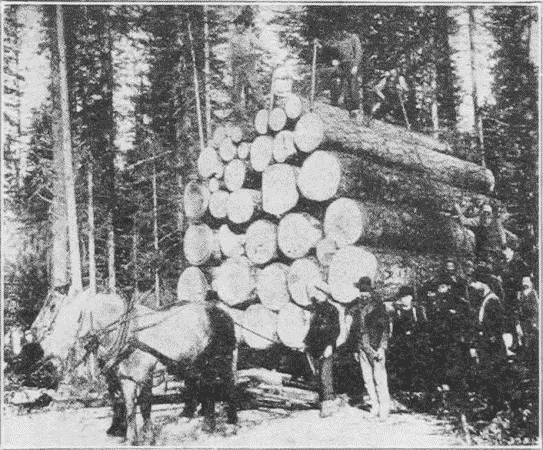 A horse hitched to the end of the chain hauls up the log, which is guided by the “send-up men” with their cant-hooks. Once piled the logs are “scaled,” that is measured in order to compute the number of board feet in them, Fig. 9. The scaler generally has an assistant, for logs in large piles must be measured at both ends in order to determine which is the top, the body of the log being out of sight. 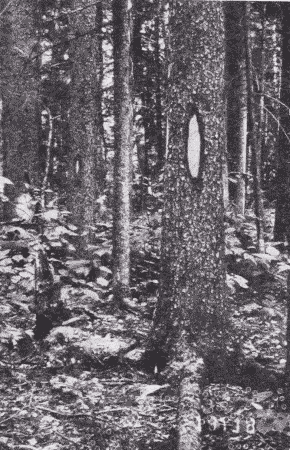 When measured each end of the log is stamped with a hammer with the owner’s mark, by which it can afterward be identified. 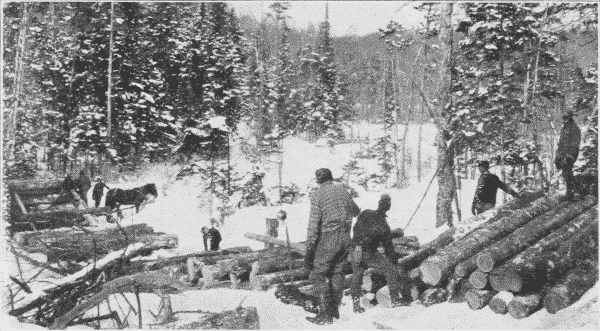 Here the logs rest and the felling and skidding continue until deep snow falls and then the sleigh haul begins. Fig. 9. “Scaling” Logs on the Skids. Fig. 10. Making an Ice Road by Flooding. Fig. 11. Decking Logs on Skidway. For this the main road is especially prepared. First the road is carefully plowed with an immense V plow, weighted down by logs. To the plow are attached fans. Only an inch or two of snow is left on the ground by this plow, which is followed by another special plow to gouge the ruts, and by a gang of “road monkeys” who clear the road thoroly. Then follows an immense tank set on runners and holding perhaps seventy-five barrels of water, and so arranged as to flood the road from holes in the bottom of the tank, a sort of rough road sprinkler, Fig. 10. The sprinkler goes over the road again and again until the road is covered by a clear, solid sheet of ice often two feet thick, extending from the skidways to the banking grounds. This ice road is one of the modern improvements in logging. Once finished, these roads are beautiful pieces of construction with deep, clear ruts. They have to be constantly watched and repaired, and this is the work of the “road monkeys.” If possible the road has been made entirely with down grades but some of these are so steep that a man must be prepared with sand or hay to check too headlong a descent. Fig. 12. 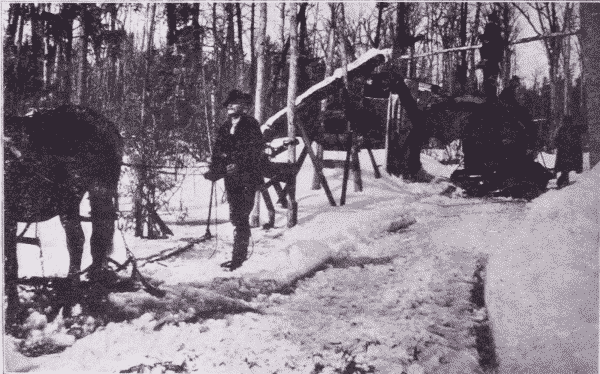 Loading a Sled from a Skidway. Fig. 13. A Load of Logs. Flathead County, Montana. When all is ready the sleigh haul begins. Piling on the sleighs or bobs, Fig. 12, is similar to piling on the skidways, but more difficult, for the load has to be carefully balanced, Fig. 13. Chains bind the loads but the piling is only too apt to be defective, and the whole load “squash out” with a rush. It is a time of feverish activity. The sprinklers are at work till after midnight, the loaders are out long before daylight. The blacksmith is busy with repairs, the road monkeys work overtime, and the cook works all the time. “Everybody works.” The haul itself is full of excitement. The ponderous load of logs, weighing anywhere from eight to thirty-five tons has to be conducted largely by its own momentum down this glassy road. If a horse fall nothing can save its life. If the runners get out of the ruts, the whole load, driver and all, is likely to be upset. It is an extremely hazardous job, Fig. 15. As each load comes down to the banking grounds, Fig. 14, or log dump, it is stopped opposite long parallel skids. The wrapping chains are unhooked and the lower log on the skid side is worked out with cant-hooks till the whole load flattens out. The logs are then “decked” on immense piles, sometimes a mile long and filling the whole river from bank to bank. A decking chain 300 feet long is sometimes required to roll the logs to their proper places. Here the logs rest till the spring freshets come. This completes the transportation by land. With the coming of the spring thaw, the river bed is filled with a freshet of water which seizes and carries the logs down stream. Many on the banks, however, have to be started on their way, and this is called “breaking out the roll ways.” They often start on their water journey with a great crash. Fig. 15. The Sleigh Haul. Fig. 16. Sacking the Rear. Now comes the drive, an arduous and often perilous task. Some of the men are stationed along the shores to prevent the logs from lodging or floating into bays or setbacks. 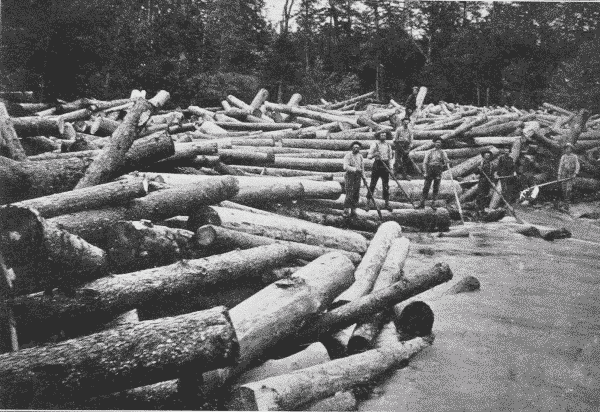 Some stand at the heads of bars or islands, where with pike poles they shove off the logs that might stop there and form a jam; others follow “sacking the rear” to clean out such logs as may have become stranded. This “sacking the rear” takes most of the time, Fig. 16. While “on the drive” men often work fourteen hours a day, a good part of the time up to their waists in ice water. Their boots are shod with “caulks,” or spikes, to keep them from slipping on the logs, and they carry either pike poles or peaveys, Fig. 17. The latter are similar to cant-hooks, except that they have sharp pikes at their ends. So armed, they have to “ride any kind of a log in any water, to propel a log by jumping on it, by rolling it squirrel fashion with the feet, by punting it as one would a canoe; to be skilful in pushing, prying, and poling other logs from the quarter deck of the same cranky craft.” Altho the logs are carried by the river, they have to be “driven” with amazing skill and bravery. Fig. 17. Log Driving on the Ausable River. The crew were working desperately. Down on the heap somewhere, two logs were crossed in such a manner as to lock the whole. They sought those logs. Fig. 18. Log Jam. Adirondack Mountains, New York. Then in a manner wonderful to behold, thru the smother of foam and spray, thru the crash and yell of timbers, protesting the flood’s hurrying, thru the leap of destruction, the drivers zigzagged calmly and surely to the shore. Sometimes cables have to be stretched across the chasm, and special rigging devised to let the men down to their dangerous task and more especially to save them from danger when the crash comes. Fig. 21. Logs in Boom. Glens Falls, New York. In case such efforts are unavailing, it is necessary to “shoot” the jam with dynamite. Another device resorted to where the supply of water is insufficient is the splash-dam, Fig. 20. 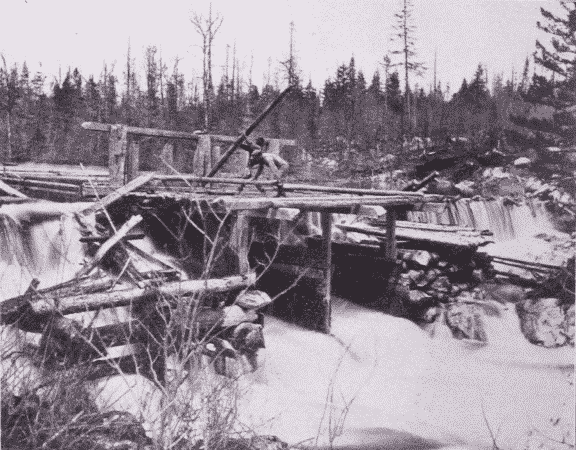 The object is to make the operator independent of freshets, by accumulating a head of water and then, by lifting the gates, creating an artificial freshet, sufficient to float the timber down stream. Fig. 22. A Sorting Jack. Thus by one means and another, the logs are driven along until caught by a boom, Fig. 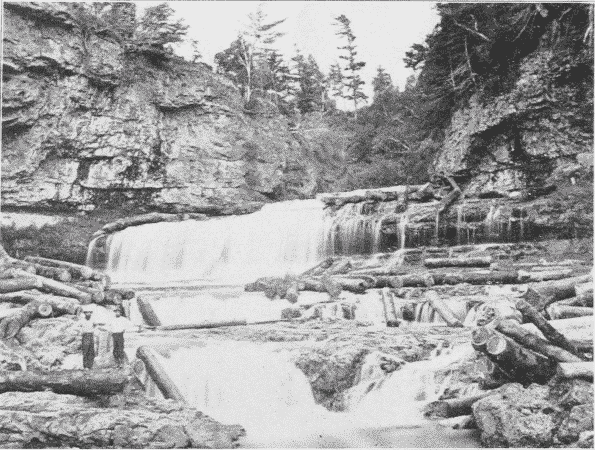 21, which consists of a chain of logs stretched across the river, usually at a mill. Since the river is a common carrier, the drives of a number of logging companies may float into the mill pond together. But each log is stamped on both ends, so that it can be sorted out, Fig. 22, and sent into the boom of its owner. The operations described above are those common in the lumber regions of the northeast and the Lake States. But special conditions produce special methods. A very effective device where streams are small is the flume, Fig. 23. This is a long wooden trough thru which water is led, and the logs floated end on. It is sometimes many miles long; in one case in California twenty-five miles. 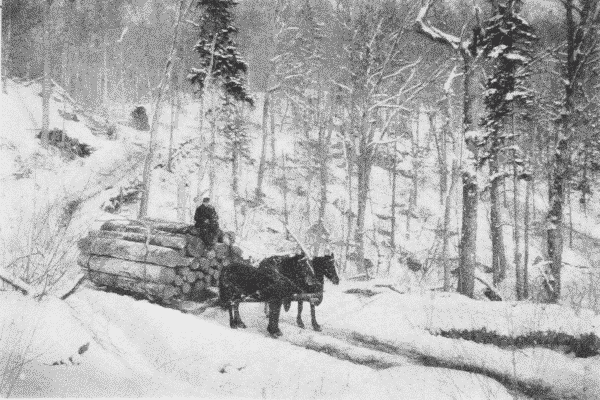 In the South where there is no snow, logs are largely brought out to the railway or river by being hung under immense two-wheeled trucks, called slip-tongue carts, drawn by mules, Fig. 24. The wheels are nearly eight feet in diameter. Fig. 23. Six Mile Flume. Adirondack Mountains, New York. Some kinds of wood are so heavy that they will not float at all, and some sink so readily that it does not pay to transport them by river. In such cases temporary railways are usually resorted to. Fig. 24. 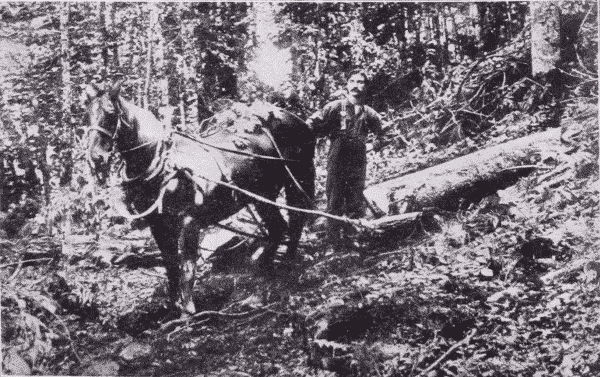 Hauling Logs by Mules. Oscilla, Georgia. On the Pacific coast, where the forests are dense, the trees of enormous size, and no ice road is possible, still other special methods have been devised. On so great a scale are the operations conducted that they may properly be called engineering feats. Consider for a moment the size of the trees: red fir ranges from five to fifteen feet in diameter, is commonly two hundred fifty feet high, and sometimes three hundred twenty-five feet high. 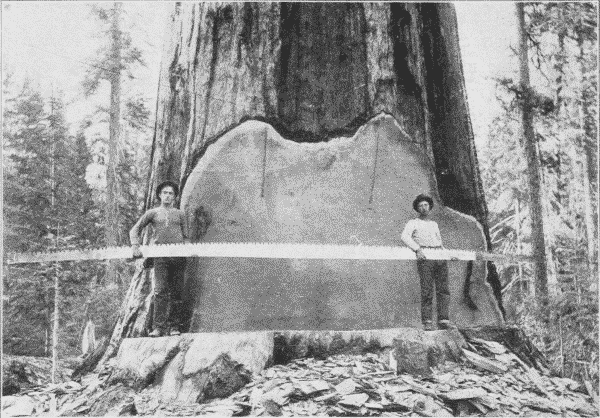 The logs are commonly cut twenty-five feet long, and such logs often weigh thirty to forty tons each, and the logs of a single tree may weigh together one hundred fifty tons. The logging of such trees requires special appliances. Until recently all the improved methods were in forms of transportation, the felling still being done by hand with very long saws, Fig. 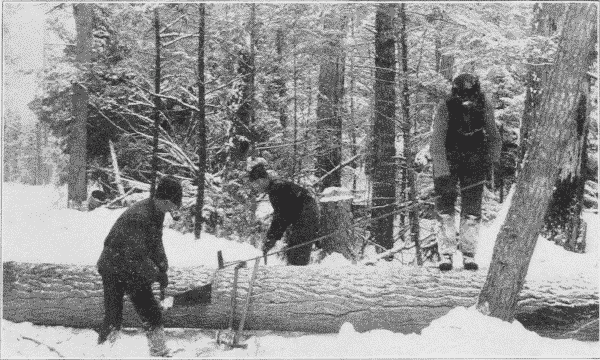 25, but now even the felling and sawing of logs in the forest is partly done by machinery. Fig. 25. 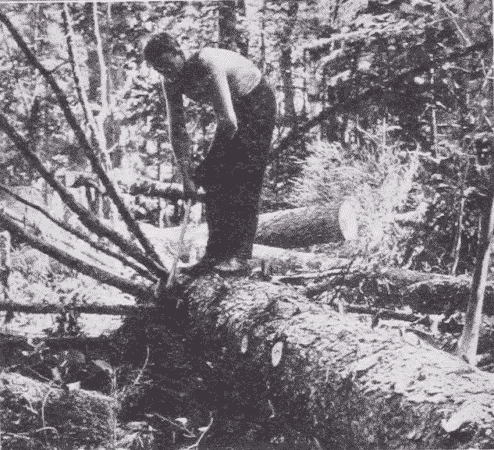 A Twenty-Five Foot Saw used for Crosscutting Big Logs. Fig. 26. Hauling Big Logs by Donkey Engine. To work the saw, power is supplied by a steam or gasoline engine mounted upon a truck which can be taken readily from place to place. As the maximum power required is not over ten-horse-power, the apparatus is so light that it can be moved about easily. The saw can be adjusted to cut horizontally, vertically, or obliquely, and hence is used for sawing into lengths as well as for felling. Falling beds. Since the weight of a two hundred fifty foot fir is such that if the impact of its fall be not gradually checked the force with which it strikes the ground may split the trunk, a bed for its fall is prepared by the swampers. Usually piles of brush are placed as buffers along the “falling line” so that the trunk will strike these. If the tree stands on the hill side, it is thrown up hill, in order to shorten the fall. After the felling comes the trimming of branches and knots and “rossing” of bark, to lessen the friction in sliding along the skidway. Yarding is the skidding of logs to the railway or water way by means of these donkey engines. Attached to the donkey engine are two drums, one for the direct cable, three-fourths to one inch in diameter and often half a mile long, to haul in the logs, the other for the smaller return cable, twice as long as the direct cable and used to haul back the direct cable. At the upper end of the skidway, when the logs are ready to be taken to the railway or boomed, they are fastened together, end to end, in “turns” of four or more. The direct cable is attached to the front of the “turn”, and the return cable to the rear end. By winding the direct cable on its drum, the “turn” is hauled in. The return cable is used to haul back the end of the direct cable, and also, in case of a jam, to pull back and straighten out the turn. Instead of a return cable a horse is often used to haul out the direct cable. Signaling from the upper end of the skidway to the engineer is done by a wire connected to the donkey’s whistle, by an electric bell, or by telephone. Sometimes these donkey engines are in relays, one engine hauling a turn of logs to within reach of the next one, which passes it on to the next until the siding is reached. Fig. 27. 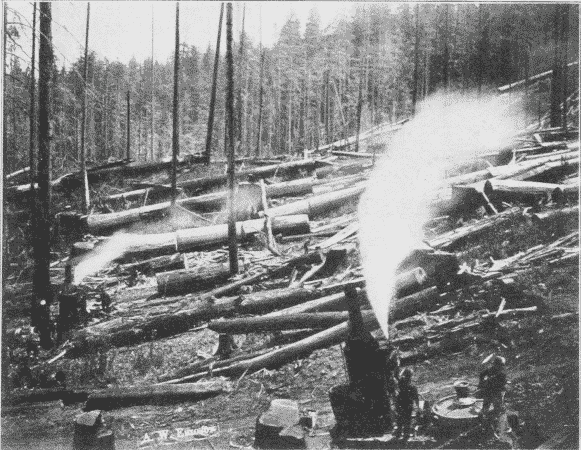 Steam Skidder at Work. Grant County, Arkansas. Where there are steep canons to be crossed, a wire trolley may be stretched and the great logs carried over suspended from it. In the South a complicated machine called a steam skidder, Fig. 27, equipped with drums, booms, etc., is much used both for skidding in the logs and then for loading them on the cars. It is itself mounted on a flat car. An improvement on this is the locomotive boom derrick which is widely used both on the Pacific coast and of late in the Lake Superior region. It is a combined locomotive, skidder and loader. Its most unique feature is that it can be lifted off the track so as to allow flat cars to run underneath it. This feat is accomplished thus: A device, which is something like that used in elevating the bodies of coal wagons, lifts the engine several feet above the rails. Then steel legs, which are curved outwardly, are lowered until the shoes which are attached to them rest on the outward end of the railroad ties. The truck of the locomotive is then folded up under it out of the way and cars can run under it, the curved legs giving plenty of clearance. The derrick attached is of the breast type, the two legs being firmly fastened. When anchored the engine can be used either for skidding or loading. For skidding, there are two cables, one being run out while the other is being wound on its drum. Fig. 28. 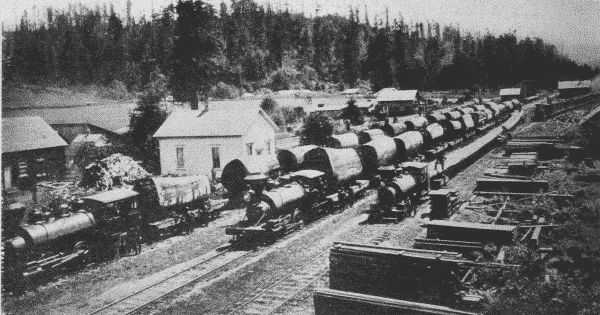 Log Train, Humboldt County, California. In loading, the machine is located so that the empty car will be directly in front of it, and then the logs are lifted up and placed on the car by the derrick. When the car is loaded the machine can either move on to the next car, or pull it under itself into place. With the help of four men it can load from 125,000 to 150,000 feet of timber in a day. By means of the cable it can make up a train, and then by lowering the truck and raising the legs out of the way, it is converted into a locomotive and hauls the train away to the mill or railway station at the rate of three or four miles at hour. 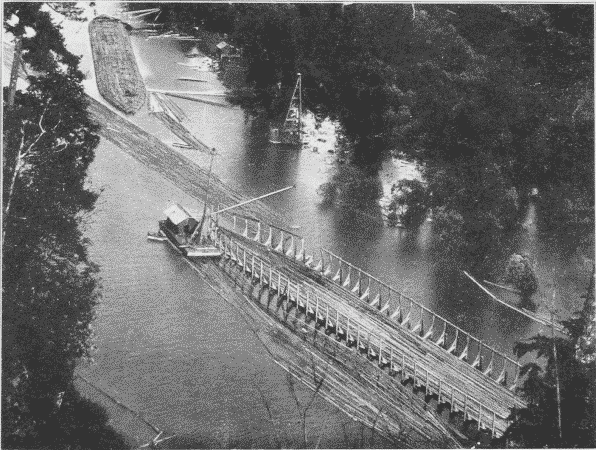 As forests are cut away along the water courses, railways have to be resorted to more and more, Fig. 28. This has had a stimulative effect on the logging business, for now the logger is independent of the snow. On account of the steep grades and sharp curves often necessary in logging railways, a geared locomotive is sometimes used, Fig. 29. It can haul a train of twenty loaded cars up a twelve per cent grade. 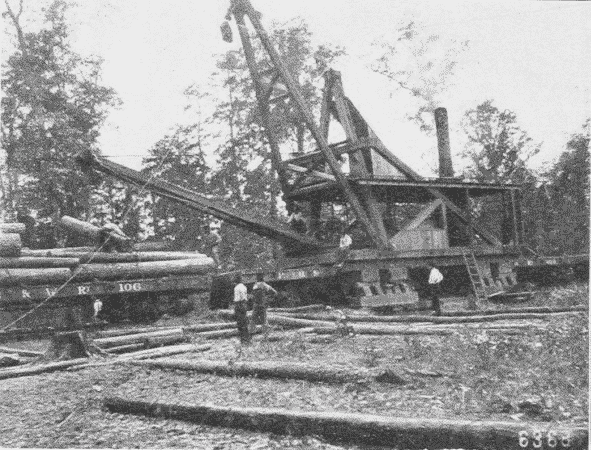 The geared engine has also been used as a substitute for cable power, in “yarding” operations. 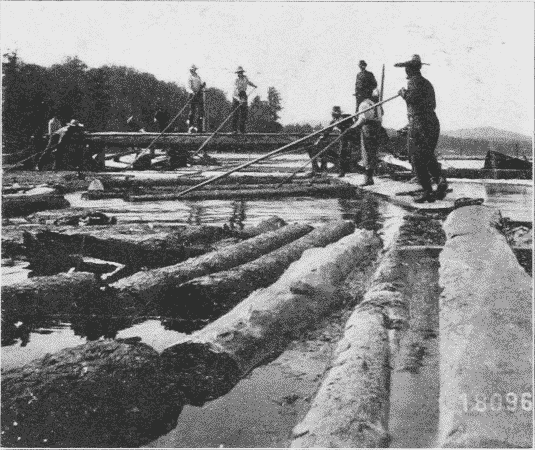 The “turns” of logs are drawn over the ground between the rails, being fastened to the rear of the engine by hook and cable. This has proved to be a very economical use of power and plant. Fig. 29. Donkey Engine Yarding. in the foreground a cradle in which a raft is being built. Another method of traction where the woodland is open enough is with a traction engine. The ones employed have sixty to one hundred horse power. The great logs may be placed on wood rollers, as a house is when moved, or the logs may be hauled in on a low truck with broad wheels. The “tractor” hauls the log direct to the railway if the distance is not too great. Fig. 31. Snow Locomotive. Takes the place of 12 teamsters and 12 horses. Minnesota. In Northern Michigan a “snow locomotive,” Fig. 31, is coming into use, which has tremendous tractive power, hauling one hundred to one hundred fifty tons of lumber over snow or ice. It moves on runners, but there is between them a large cylinder armed with teeth. This cylinder can be raised or lowered by the operator as it moves over the surface of the ground. The teeth catch in the snow or ice, and since the cylinder is heated by the exhaust steam, it melts and packs the snow for the trucks following it. The drum is six feet in diameter, with walls an inch and a half thick, and it weighs seven tons. It is used in all sorts of places where horses cannot go, as in swamps, and by substituting wheels for runners it has even been used on sand. 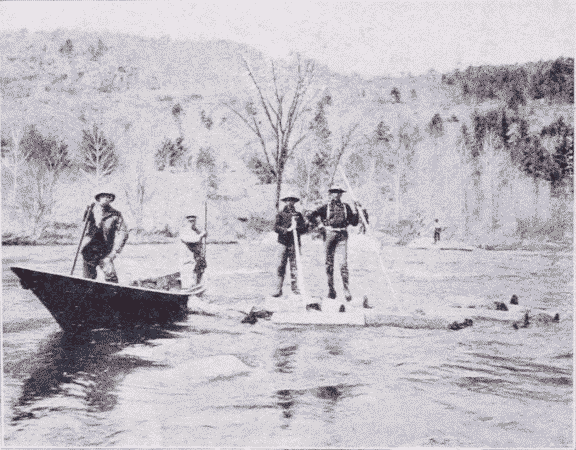 In the Canadian lakes there has been devised a queer creature called an “alligator,” a small and heavily equipped vessel for hauling the logs thru the lakes. When its operations in one lake are finished, a wire cable is taken ashore and made fast to some tree or other safe anchorage, the capstan on its forward deck is revolved by steam and the “alligator” hauls itself out of the water across lots to the next lake and begins work there. The greatest improvement in water transportation is the giant raft, Fig. 30. When such a raft is made up, logs of uniform length are placed together, the width of the raft being from sixty to one hundred feet and its length, one thousand feet or more. It may contain a million board feet of timber. 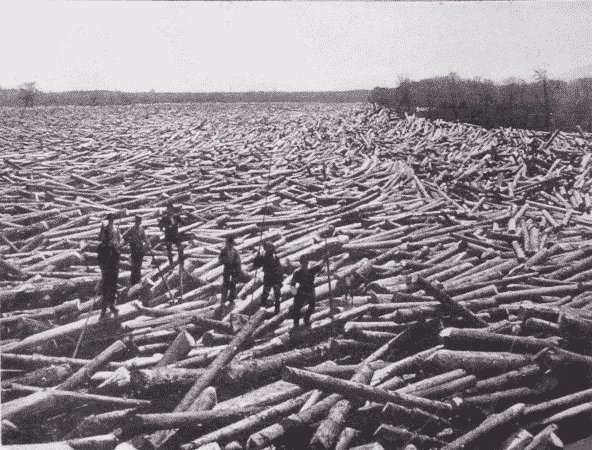 The different sections are placed end to end, and long boom sticks, ie., logs sixty to seventy feet long, are placed around them to bind the different sections together, and finally the whole mass is heavily chained. Such a raft has been towed across the Pacific.